The DigiAir is a single-path GPRS signalling device that communicates between an intruder alarm system and an Alarm Receiving Centre. It is similar to a regular Digital Communicator but instead of using your analogue landline to transmit, the DigiAir uses the GPRS network. If your alarm system is not currently sending “open and close” signals every time you unset and set it, with no call charges associated with DigiAir it makes sense to add this free facility. Then, if you were unsure whether you set the alarm or need to check what time your cleaner arrived (and you aren’t at home to check the alarm log) then you can call us and we can access the Alarm Receiving Centre (ARC) logs for you. Also, unlike your 250 or 500 event log embedded in your alarm system, the ARC logs are never overwritten. 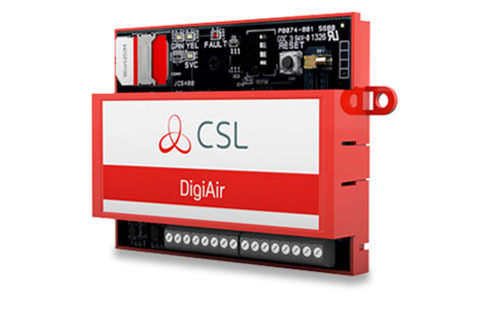 CSL, the company behind DigiAir, is the leading alarm signalling provider in the UK. In addition to saving on call charges, if you only use your landline for alarm signalling you can save further money on line rental as you will no longer require the landline. Analogue telephone networks are gradually being upgraded from copper to fibre, known as Next Generation Networks. Many alarm digital communicators are not fully compatible with NGN’s as they use different technologies. This can cause permanent or random issues when communication is actually required. For example, instead of a single “burglary” signal being transmitted, that signal could be re-dialled and re-sent multiple times due to the acknowledgment “handshake” between the alarm system and the Alarm Receiving Centre not being recognised. This can result in significant spurious call charges. It can also cause signals to not be correctly received and processed. Dualcom has a patented roaming WorldSIM that will lock on to the strongest network of any of the major airtime providers. This means that if one network goes down your alarm system should still be able to communicate. The Dualcom DigiAir is a Grade 2 single-path GPRS signalling device that is a cellular alternative to a regular landline. For higher risk premises, whether an insurance requirement or not, dual-path signalling systems are available which offer a much higher level of robustness and redundancy, using combinations of GPRS and landline or GPRS and IP. Please contact us if you feel your property now requires a higher level of protection.